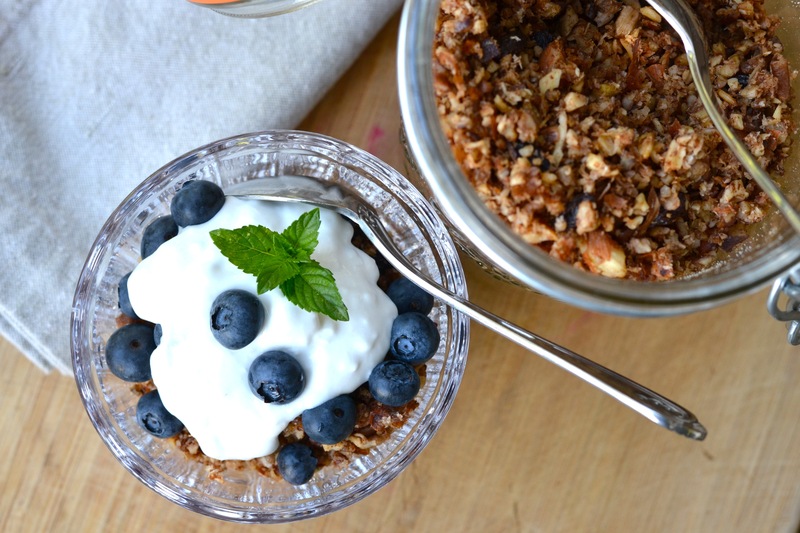 This delicious granola serves up tons of flavor and is rich in heart-healthy fats as well as protein. 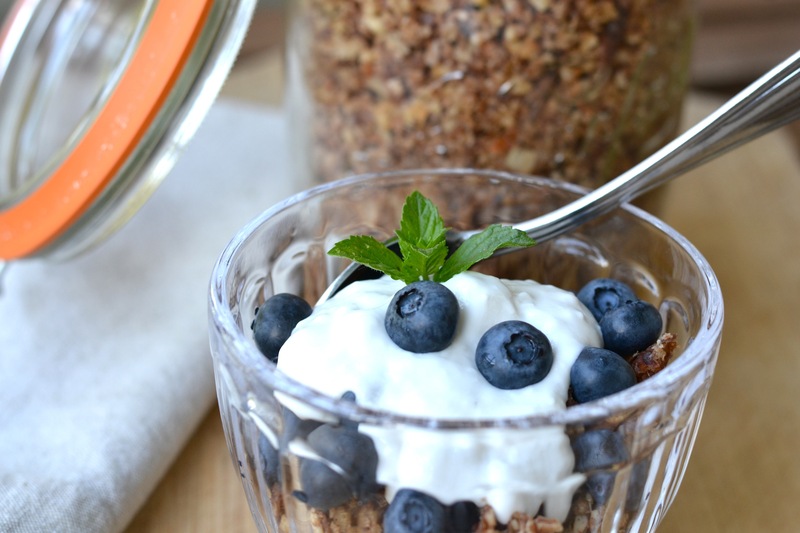 Top it with a dollop of homemade yogurt (I love using my coconut milk yogurt) and a sprinkle of berries, and you have a filling breakfast that will last you for hours. In fact, compared with traditional granolas, which contain mostly oats, you need about half as much as you think you need for a very satisfying breakfast meal. I also like to have a canister of this granola on hand for days when I’m rushing to get the kids off to school or camp, and I barely have enough time to eat after preparing their breakfast, snacks and lunches. And when my kids are craving something sweet, a sprinkle of this granola over yogurt and berries does the trick. Place all the nuts and seeds in a large glass or ceramic bowl. 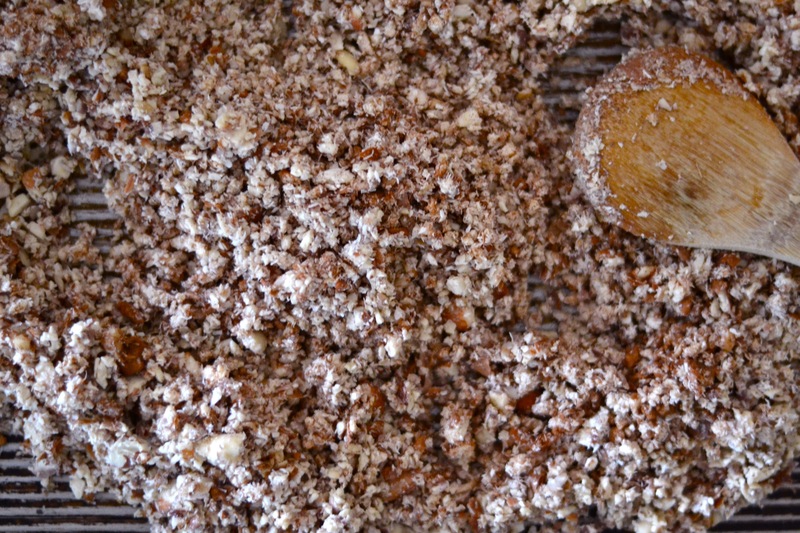 Sprinkle with 1 tsp salt and pour in enough filtered water so that the nuts are covered by 2 inches. Cover with a dish towel and let soak overnight on the counter (at least 12 hours). Drain the nuts and seeds and spread out on a paper towel to absorb the extra water. 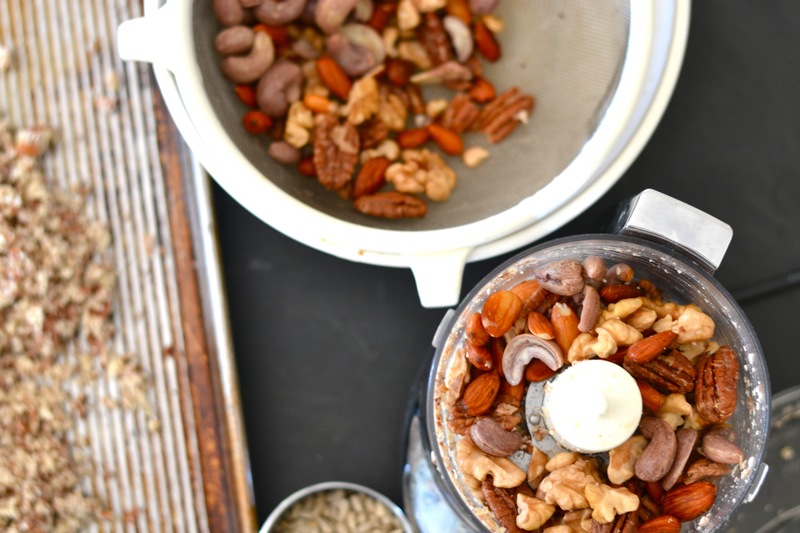 Transfer the mixture to a food processor and process until the nuts are the size of porridge or quick-cooking oats. Spread out onto a large, rimmed baking sheet. Sprinkle the remaining salt and cinnamon over the mixture, and stir in the coconut. Melt the coconut oil in a small saucepan. Stir in the maple syrup and vanilla extract. Pour over the mixture on the baking sheet and stir to mix. Place the baking sheet in the oven and cook for 1 hour, carefully flipping the granola with a spatula every 20 minutes. Stir in the raisins if using. If you want to keep this dish “raw,” cook the mixture in an oven set to 175F with the door propped open a tad (using a wooden spoon). Cook for closer to 2 hours using this method. Makes approximately 5 cups of granola.